Here comes the wind-up, now the pitch, and the batter is ready.?? Hit and its out of the park.?? Home run.?? These softball trophy awards are simply unmatched in quality and choices. These colorful resins feature a realistic looking softball wrapped in a ribbon banner and sitting on a gold pyramid on a black base. Just add a plate personalized for your event to the base for a budget friendly way to recognize achievement on the softball field. This resin award is available in 2 popular sizes. 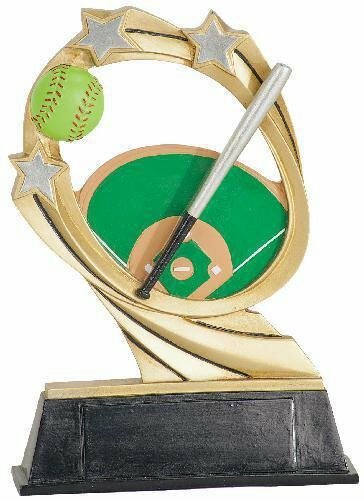 Gold Resin trophy series made of durable resin material with a gold base (5 1/4" x 2 1/4" base dimensions). 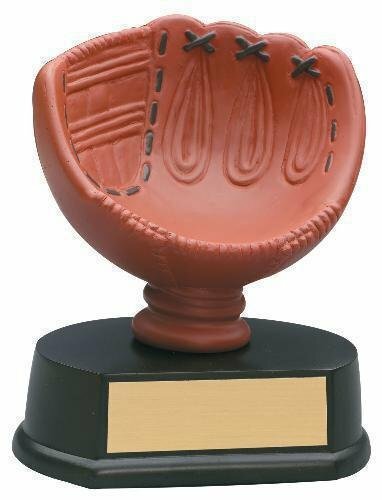 Each resin trophy comes individually boxed with personalized engraving plate that is 7/8" x 2 5/8"
A banner embellished with gold stripes and gold cut out stars wraps around a full color softball and stands on a black rounded base. This modern design resin can be personalized for your event and makes unique award for achievement on the softball field. The bold rising star banner at the top of this shield design resin broadcasts that you are presenting the award for excellence on the softball field. The textured background features a 3 dimensional softball scene, and the resin is mounted on a black base with plenty of room to personalize for your event. Available in two sizes, this modern resin award will be a big hit! This full color resin features an oval swirl of silver and gold shooting stars orbiting a softball, bat and diamond giving this piece a sense of motion. Add a personalized plate for your event for a modern, budget friendly award that is out of this world. A large full color softball appears to be flying off the surface of this ½” thick diamond resin plate for a 3-D look. It comes with a metal peg that can be screwed into the back for a free-standing award, or you can leave the peg off and mount the diamond to a plaque for an entirely different application. However you chose, just add a personalized plate for a unique award. A gold diamond cut out of a full color softball, framed at the bottom by gold shooting stars serves as the back drop for the batter hitting the softball out of the park. This 3 dimensional resin comes with a gold peg that can be attached at the back to make this a free standing award, it can be mounted to a plaque, or the ferrule at the bottom can be used to attach it to a trophy. Personalized for your event, any of the 3 applications are a modern, unique way to recognize and award prowess on the ball field. The softball DuraResin is a new design that features a twist on the traditional wreath. This wreath nestles a full color softball attached to a gold and black ribbon that is draped over the top ends of the wreath. The black base has plenty of room to add a personalized plate for a simple, unique award for excellence on the softball field. The Softball Encore Resin is available in multiple sizes. This resin trophy award is simply a fun award that kids will love. It features a full color softball resting on a pedestal adorned with stars. Add a plate to personalize for your event for a great way to reward achievement on the softball field. This 5" full color softball glove actually holds a regulation size softball. Add a personalized plate for an award that doubles as a display for a cherished softball.